Although landmarks are an integral aspect of navigation, they have rarely been used within electronic navigation aids. 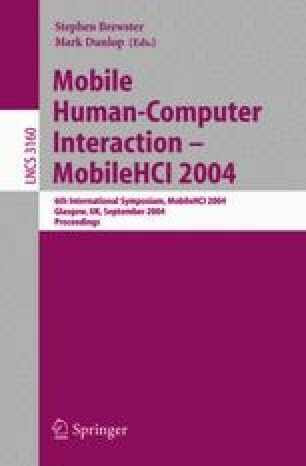 This paper describes the design of a pedestrian navigation aid for a handheld computer, which guides the user along a route using photographs of landmarks, together with audio and text instructions that reference these landmarks. This aid was designed with older users in mind who often find their mobility hampered by declines in sensory, cognitive and motor abilities. It was tested against the standard paper map for the test area with both younger and older people and their performance and subjective workload were measured. The results show that such an aid can significantly outperform a paper-based map and that older people derive substantially more benefit from it than do younger people.